December | 2011 | Run. Dog. Cat. Cat. Me. We’re a very blessed group of people, runners. Running is a microcosm of life. It’s a journey which redefines us, deepens our identity, strengthens us. Running is not a team effort. We run alone. No one is going to get us out of the warm bed or pull us away from Facebook and push us out into the world. If we have a running coach, he’s not going to bench us for the game while the local sports writer rants about us because we skipped practice. If we run with a group, they aren’t going to unsubscribe us for not showing up. Running is commitment, a promise made and kept by us alone. Running is hot, and cold, it’s rainy and snowy and humidity thick as soup, it’s pain in every step, orthotics, braces, a bathroom fragranced by Icy Hot, having your podiatrist as a contact in your iPhone. Running is the look of asphalt sliding past under your feet, the wrinkled peeling bark of trees along the trail, deer spotted in the cold misty morning. It’s old towels, gloves, Hot Hands, empty Gatorade bottles, stray socks, an extra hat and crushed race bibs in the trunk, shoes strewn about the garage, smelly shirts hanging on doorknobs. Running is being so completely slap happy at mile 18 that all you can do is point at your running partner and sob laughing because neither of you can subtract 18 from 20 to determine how much further you need to run. Running is blowing a snot rocket in the grocery parking lot and only realizing you did so when you note the shock and horror on the face of the sweet old lady in the Oldsmobile next to you. It’s seeing someone you’ve run with for 6 months at the movies and not recognizing them because “they’re wearing clothes”. It’s realizing that everything you have on except your jeans is running apparel, up to and including your sports bra. Running is also sitting next to your father in ICU for two weeks knowing he will never be the same again, or watching your friend’s grown son collapse, sobbing, onto his father’s shoulder as they bury his mother, or whatever shadow darkens your life, knowing that you can do this. You can get up, you can get out of the house, you can make it through this horrid day because you know that it’s just a part of the journey, not the whole. It’s just this day, it’s just these steps, and while you’re plodding through, looking down at the dark road beneath your feet, you can at the same time look up and see the sky. 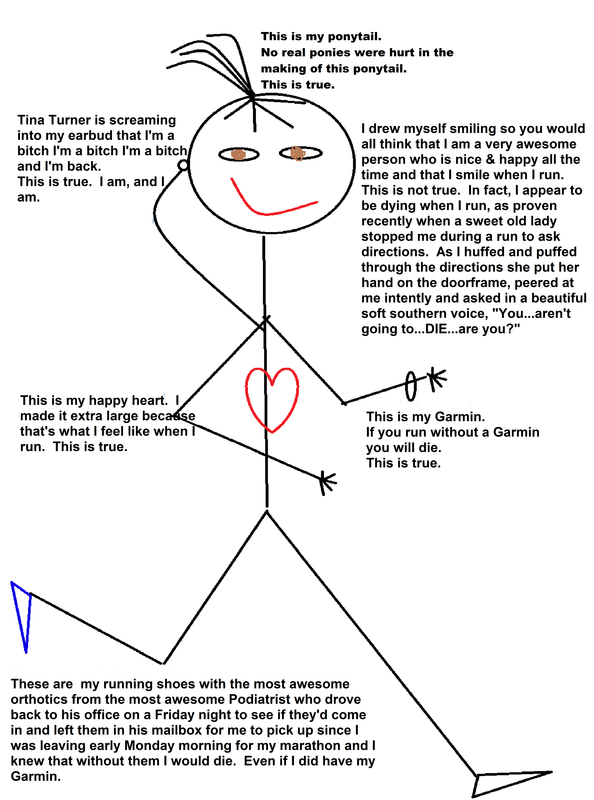 Because you are a Runner.